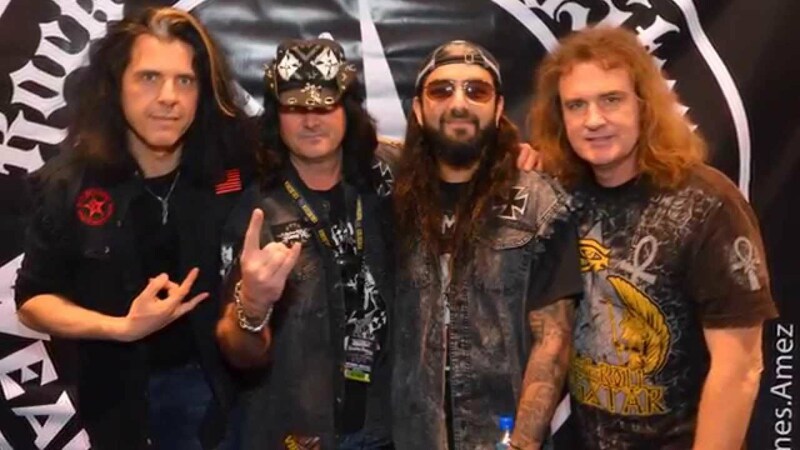 There was much buzz about the Metal Allegiance group formed in 2014. Consisting of veterans Mike Portnoy, Alex Skolnick, and David Ellefson (as well as Mark Menghi), there was an excitement due to the round-robin vocals as well due to a different singer or singers on each track. An EP closely followed their 2015 debut, but many assumed that it was simply a supergroup project, and nothing much more would come out of it. Now in 2018, we are witnessing the second act from the band, with Power Drunk Majesty delivering a new full-length of tunes to those in search of some timeless metal antics. 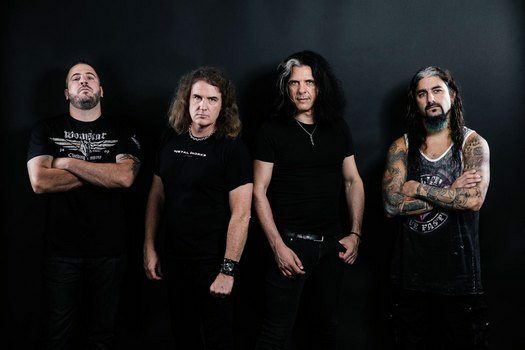 A release that feels more focused and cohesive than the first volume, Metal Allegiance makes good on their stacked line-up and notable guests by being more than simply a bunch of tunes stuck together. It feels like an album, even if the vocalists are varied. The group has also been doing more live shows, in which they assemble who they can, making each outing a memorable one. We grabbed Alex Skolnick to talk about these topics, as well as his upcoming Alex Skolnick Trio release, his playing styles, as well as his thoughts on metal. Dead Rhetoric: Do you feel that with Power Drunk Majesty, you’ve gotten people past the idea that Metal Allegiance is simply a side-project? Dead Rhetoric: So two albums in, what do you feel are the main tenets or features of Metal Allegiance as a band? Skolnick: I think it definitely has a spirit to it. It was there on the first record, but even more so on this one. The fact that those of us who are architects of this music, we are all professionals but we are very in touch with being fans. I think that comes through – and not just fans of the music we grew up with, but the whole aesthetic…liking a record, or album. Not just a single or a file [laughs], even if it is available digitally and people can buy or stream a track if they choose to. It’s really for the people that want to own a record and enjoy the process of owning a record, preferably vinyl, but there are cds too. Also, hard rock to me began around [Jimi] Hendrix and Queen, and it became heavy rock or even metal around the time of Black Sabbath. Right up until the mid-to-late ‘80s, the majority of it was all recorded naturally. It was before the digital process got in the way. I think there are people, even currently, who are able to make great music and can’t tell that it has been helped by digital processes. Pretty much everybody uses digital technology as part of the process. But some people overuse it. A lot of music does that. It becomes obvious, and the music loses its quality. There were plenty of chances on this record – I played all the riffs, and there were plenty of times where I could have said, “Oh, that riff sounds good. Let’s just copy that and use the same part.” I chose not to, because if I’m playing live it’s not going to be exactly the same. Part of what’s exciting is that verse two might sound a little different than verse one. The great Ozzy records – Randy Rhoads doing different fills maybe on verse two. Could you imagine if he had copied and paste “Mr. Crowley?” It really wouldn’t be that interesting. They made it perfect. It wouldn’t have the magic that it has [with technology]. We are very aware of that and we tried to show that awareness in our records. Dead Rhetoric: I think you can hear that timeless quality behind the music, but it never really sounds dated either. Skolnick: Yes, that’s true. It doesn’t feel dated. One of the ways that technology has been good has that sound quality has gotten very good. We wanted that same sound quality but with the feel of the classic records that we grew up with, where everyone is playing. If you ask someone to play something off the record, they can play it [laughs]. It’s not a challenge to recreate it live because of some studio magic. But also, the music does feel modern. At this point, so much music is influenced by other music. It’s really hard for someone to really sound dated, unless you record it with a process from a long time ago and recreate that. We aren’t trying to recreate anything, but taking elements from days past that we find missing today. Dead Rhetoric: Going along with the timeless and modern piece, was it important to have a diverse group of vocalists, in pulling from both veteran and newer acts? Skolnick: I think part of the whole purpose is to have a lot of variety. One of the things that is fun about writing for it is there is a different voice in every song. It’s a challenge. We don’t always know what voice is going to end up on each song. Some songs, we have a pretty good idea, like the Johan Hegg [Amon Amarth] track. I think that riff was very clearly calling for him more than anyone. We knew he was going to be the guy for that track. But there are others that it could have went to a number of different singers. Which could have affected how they turned out. It was different with every song. Dead Rhetoric: Knowing that you do a lot of the vocal phrasing, is it cool to see all of these singers belting out what you wrote and making their spin on it? Skolnick: Oh yeah, absolutely. Every vocalist works differently. Someone like Johan, he has his own style and his own take on things. He really needs to find a way that works for him. Same with Floor [Jansen] from Nightwish. But then there are other vocalists who want guidance. The vocal demos that I did, I think I did about half the record. The one that comes to mind is the one I did for Troy [Sanders], “Liars and Thieves.” I tell everyone not to sing like me [laughs] – I’m not a metal singer. But I knew that phrasing-wise, I could do a good guiding vocal for him. He did it and he did it in his tone, and it sounded tremendous, which is exactly what I wanted. We did that on a few songs. It’s great, because I’m imagining a certain phrasing, with that voice. These are very distinct voices, and it was very gratifying and exciting. It was like, “Yes, that was what I was imagining!” It sounded even better than I imagined when they would send their parts back. Dead Rhetoric: I would imagine at this point you are getting a lot of people asking to be on a track? Skolnick: That’s true. There are more people asking than we have room for on a record. But it also comes down to scheduling. Sometimes we are looking at someone for a track but scheduling-wise it doesn’t work out. Which is fine. That happened a lot on the first record as well. Dead Rhetoric: In knowing that you are going to pull a variety of singers, what do you feel helps to keep the album cohesive? Skolnick: I guess there’s some consistency. On this one, I’m playing all the riffs, so it’s my tone throughout. The drums are all the same, with Mike Portnoy throughout. The bass does change, as its Mark Menghi on six of the ten tracks, and [David] Ellefson is on four. But I think we can work around that. But having the same guitar and drum tone really helps. There’s also some stylistic consistency throughout the whole thing as well. Dead Rhetoric: When it comes to live shows, do they feel like special events due to grabbing different vocalists to participate? Skolnick: They really do, yeah. They are special events and they are all different. We didn’t really know how well it was going to turn out. We’ve learned to embrace that most of the shows have a slightly different line-up. We can take that and make it special. It’s a special thing that you are getting. It’s fun! We also realized that it is more realistic for us to do special events, such as festivals, cruises, conferences, and other award or types of situations where there are a lot of us in the same place at the same time. It’s harder to book a traditional tour because we have so many schedules that are constantly changing. But we are able to squeeze in a few shows here and there, such as the album release show which is coming up on September 6 in New York City. Dead Rhetoric: What do you like, creatively, about being able to work with multiple bands and projects? How is it fulfilling to you? Skolnick: To me, I really like stepping into different situations. I figured out early on that I’m an all-around guitar player. That’s kind of a rare thing for people who play in metal bands. One of my biggest influences was Randy Rhoads. I think it’s a shame that we don’t know what we would have done. I think of him as a metal Jeff Beck. Jeff started with The Yardbirds, and look what he went on to do. Randy Rhoads started with Quiet Riot and is best known for his work with Ozzy. He didn’t have that chance. I always wanted to be like that. Jeff Beck is still a big influence. I like to step into different situations. I had to not be in a band for a while – the mid-‘90s to the early ‘00s was an intense period of study for me. I got a music degree at a university and established relationships in the instrumental world beyond metal. Coming back to Testament in 2005, along the way working with this mammoth concert production called The Trans-Siberian Orchestra, I just had these different experiences. I’m happy that I can play a small jazz venue and a giant concert hall or amphitheater. Yesterday I played the biggest amphitheater in Seattle to a packed house. I take every gig one at a time and enjoy them. Each one is a different environment as well. When I play with my Trio, for example, these are musicians that play in a much different manner than when I play with Testament or Metal Allegiance. It’s a different atmosphere for me to create, and I can tap into different influences. I can tap into my Wes Montgomery influences, my Jeff Beck influences – sometimes I can sneak it into the metal stuff but it’s different. Testament was how I got into this – being a young guitarist for Testament. But it’s also not a band that I started, which I’m very respectful of. 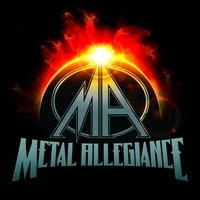 Metal Allegiance has given me a chance to be the main songwriter, studio guitarist, and the co-producer. The first metal records that I got into were Ozzy with Randy Rhoads, Dio with Vivian Campbell, where you had very high level guitar playing, and these guys were playing all the riffs too. Testament is the type of band, like Megadeth where Mustaine is the riff guy, or Hetfield in Metallica where he is the riff guy. Live, everyone plays the riffs, but in the studio they are the guys. It’s fun for me to be the riff guy with Metal Allegiance as well as the main soloist. Dead Rhetoric: You alluded to this, but what can you say about the new Alex Skolnick Trio release Conundrum? Skolnick: Conundrum took a few years to write, and we actually featured some of the tracks on our first live release, Unbound. Out of the blue, we had a bunch of offers to tour, and it was time to do a release – two of the songs ended up on Unbound – “Unbound” and “Culture Shock.” The rest of the songs, it will be the first time that you will hear the Trio doing them. It’s the first time that I’m not borrowing from the catalog of rock and metal dudes that I grew up with and re-arranged. We still love doing that – we still do some of those tunes, but it was time to do an album of all original music. That comes out September 7th…the same day. It’s going to be a big month for my music outside of Testament! 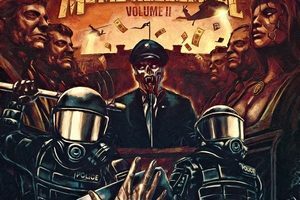 Dead Rhetoric: Being in the thick of it for as long as you have, what do you like about heavy metal in 2018? Skolnick: I think it’s very much the opposite of its reputation. It has a reputation of people being very troubled and indecent – there was a whole movement in the mid ‘80s about decency in music and heavy metal was singled out. So many people that I know in the metal community are some of the most decent people. I’m on a tour right now – one of the biggest metal tours of the year, with five different groups and there’s no drama. I was just talking about this with Tom Araya yesterday. Everybody is just positive and having a good time. We like each other. Sure, every band in any genre goes through difficult periods. No one us are immune from that. We have line-up changes and drama – we have all come around and come through it. There’s a great comradery, and the fans are so dedicated and so loyal and respectful. Yes, you get some jerks online that think they know it all, but I think that happens [everywhere]. It’s not limited to metal at all. I’ve never understood that – if you don’t like an album, why must you go online and make a big announcement that you don’t like it? So yeah, there are some real a-holes but they are the minority. The vast majority are respectful and have the same comradery felt by the bands. It’s also not dependent on mainstream trends. On this tour, for example, it doesn’t matter where Slayer’s record charted at. I don’t know what it charted it. Or Anthrax, Lamb of God, or us. I don’t know. In pop, that sort of stuff matters. Is Katy Perry selling more records than Jennifer Lopez, or whomever? It doesn’t matter in metal. It’s all about the music, and the dedication extends for decades. It’s a great thing! Dead Rhetoric: What do you have in the works for the rest of this year and into 2019? Skolnick: Things are pretty packed! 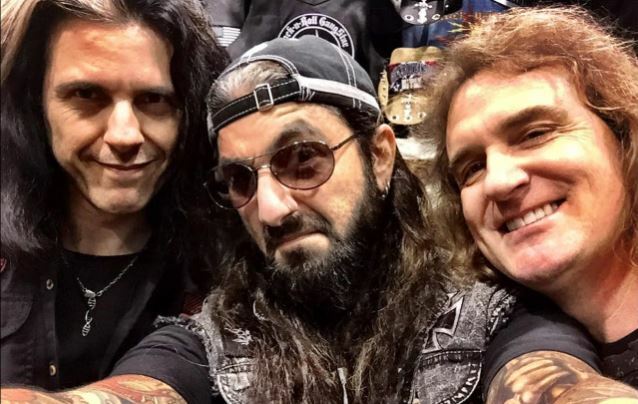 There’s the Metal Allegiance release show, then a week later the Trio has album release shows in New York, Chicago, and Los Angeles as well as a week in Texas. In between, I will be writing new music for Testament. 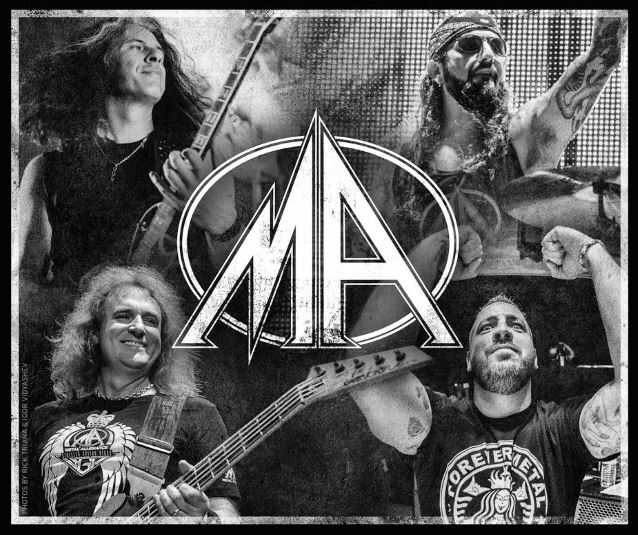 We are looking at more Metal Allegiance shows and more activity – the response to both the Trio and Metal Allegiance has been amazing, so I’m getting ready for this ride while working on Testament. Then in between, there are other instrumental artists I work with, Stu Hamm, who is a great bass player I play with, and we have a few shows booked for next year. We may end up doing a record together. So I’m just taking everything one step at a time.